I’m a perfume junkie, all thanks to my mom, so when I read recently that Sephora was carrying a new line by NEST Fragrances, I jumped at the chance to try it. The hardest part was picking which fragrance to try, and I decided to buy the rollerball version, just in case. While I don’t recommend buying perfume online unless you’ve already smelled it, I’m pretty good at guessing the basics of a scent by reading the description given. So, I took a chance and ordered Midnight Fleur, because I was intrigued by the combination of Black Amber, Vanilla Orchid, and its other darker scents. I’ve worn enough perfumes in my day to remember what I like, and I typically prefer floral fragrances, with a bit of a woody undertone, like sandalwood. Midnight Fleur definitely falls into that category, and when I first smelled the tiny tube, my synesthesia kicked in, and I saw navy blue. It’s definitely a darker fragrance, which is popular these days, and the gorgeous label and packaging really capture the essence of the scent. That probably sounds pretentious, like I’m describing a fine wine or something, but perfume definitely falls into that category, I think, and it’s tricky to describe something that you can’t smell at the same time. When my package arrived, my mom was visiting, and she smelled it and immediately gave her approval, so I know I did a good job. 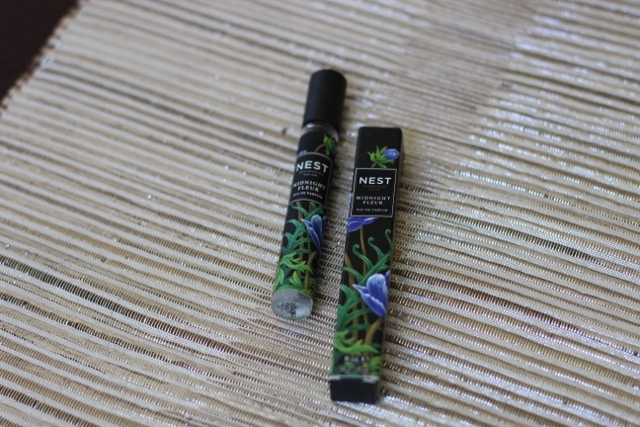 While it’s a little light and needs to be reapplied during the day, NEST’s Midnight Fleur is a lovely scent for fall and winter, and the rollerball option is really affordable. Next, I’m excited to try their coffret of five perfumes.